Welcome to my practice. 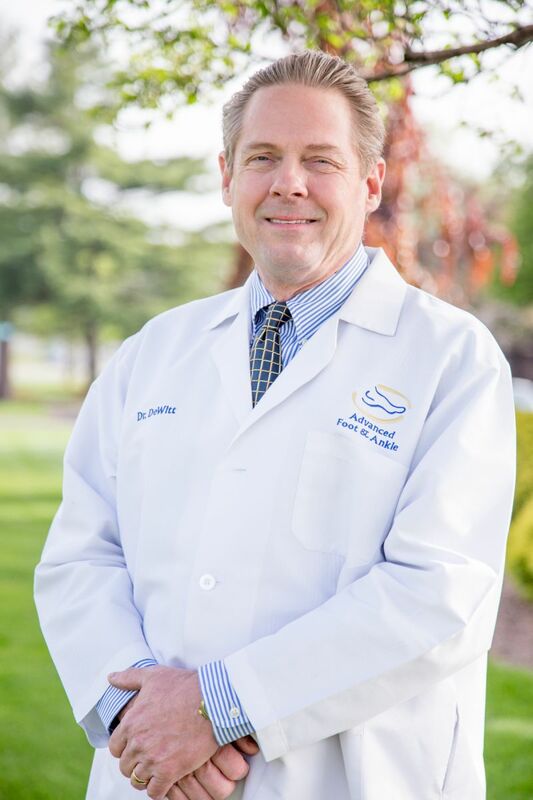 I have been practicing podiatry in the greater Grand Rapids Area for over 20 years. As a licensed podiatrist, I believe my patients deserve to have the best information to make choices about their foot and ankle care. My goal is to educate each patient and begin a relevant treatment program with the highest quality of care available. Katerina joined our team in April 2018 as our office manager. She has almost 10 years of healthcare experience. Katerina was a Medical Assistant for 6 years when she decided to go back to school for Health Service Administration. She received her bachelors degree from Baker College in August of 2016. Katerina you will often hear as being referred to as Trina in our office. This has been her nickname her whole life. She has been married for 11 years and has 3 children. Trina loves camping, football, and warm weather. She would much rather be around a bon fire with family and friends before finding her in a crowded place. Katerina has a lot of experience in a specialty office and has a lot of passion to treat patients with the best experience possible. She strives to make each visit an asset to the patient’s health and well being. Lisa joined our team in 2014 as a receptionist and soon after became our billing coordinator. 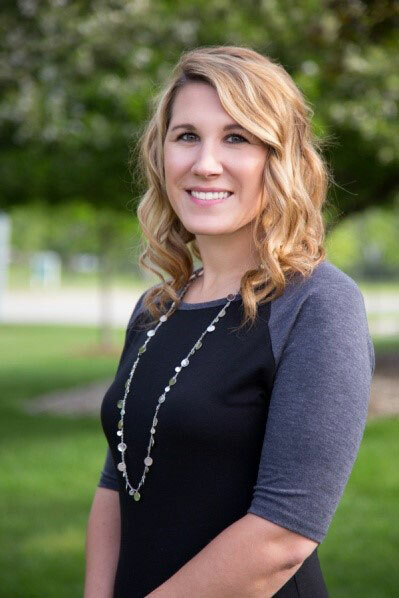 She received her bachelor’s degree in Healthcare Systems Administration from Ferris State University. She is married and has one daughter and one son. She enjoys camping, kayaking, gardening, and being outdoors as much as possible when she is not at work. Podiatry is interesting to her because fixing a problem with the foot can help fix other problems throughout the body. It is interesting that everything in the body is so connected. Lisa enjoys the small office environment at AFAA rather than a big corporation. Meg joined our team as a medical receptionist in March 2016. She quickly took on a new role as our Medical Transcriptionist, preparing documentation and compiling chart notes. She enjoys interacting with patients of all generations as podiatry affects young and old. She finds the anatomy of the foot and ankle interesting due to the significant number of bones and soft tissues. The small office atmosphere at Advanced Foot & Ankle as well as working closely with other women who have children the same age have been a perfect fit. Meg has been married and has two sons. When not working she enjoys camping with family and friends as well as boating and other summer activities. degree inHealth Fitness from Lake Superior State University. She has also worked as a medical receptionist for five years bringing extensive expertise and knowledge to our practice. 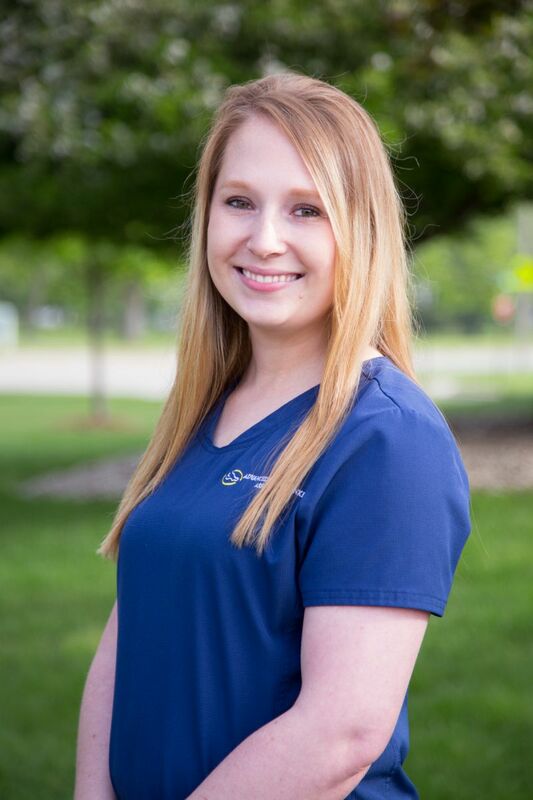 Chelsea loves greeting patients and helping them with any administrative questions they may have. She enjoys seeing patients that are in pain leave the office with relief. She finds podiatry interesting and is excited about learning more! At home, Chelsea is married to a wonderful husband and is a mother to three young boys. She enjoys photography when she is not working as well as being outdoors and staying active. Tammy started her career working in an AFC home where she served as a DCW Manager for four years. She also has 10 years of experience working as a CNA in a wonderful nursing home helping residents with ADL and other daily activities. She later relocated her family to Grand Rapids and worked for Spectrum Health as a Nurse Tech in the emergency room. We are blessed to have her join the Advanced Foot and Ankle team as a Medical Assistant providing our patients with exceptional care. Tammy has chosen a career in healthcase because she enjoys making a difference in people's lives. Her dailygoal is to do everything she can to make patients life just a little bit easier. 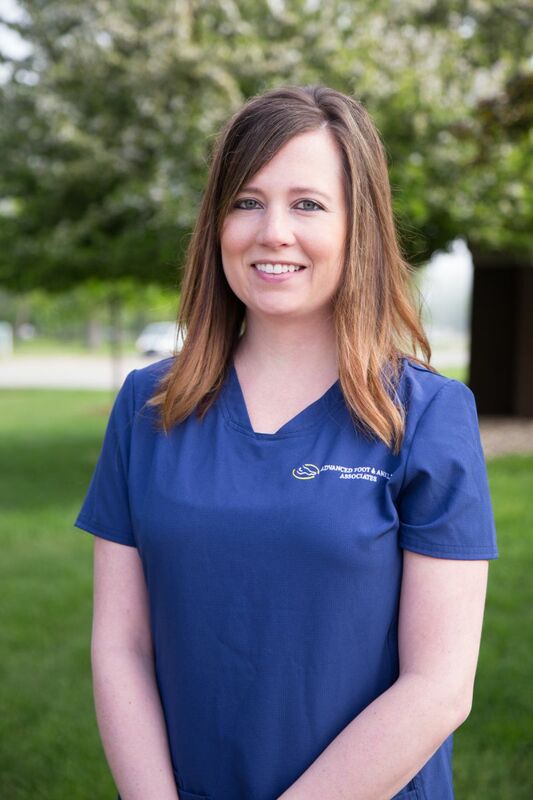 She enjoys working for Advanced Foot and Ankle because it is a small practice and provides a more personal relationship with patients and co-workers. When she is not at work she enjoys spending time with her family which includes her High School sweetheart and two remarkable young men, ages 10 and 12. She stays busy with sports and after school academic programs. She likes to read, draw, and create projects from Pinterest. Tammy has a great sense of humor and is always making us and patients smile! 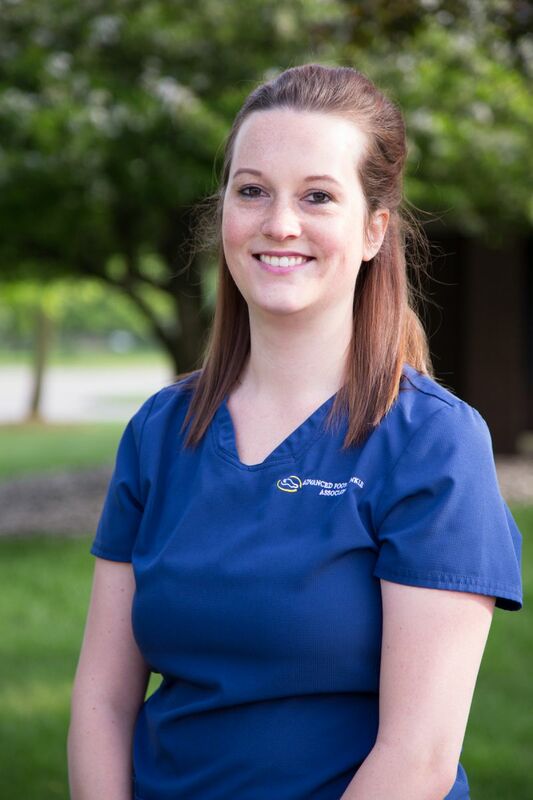 Mallory’s first experience as a medical assistant was as an intern at a small family practice in May of 2011. She learned a lot during her time there and enjoyed the intimacy of a small, single provider office. 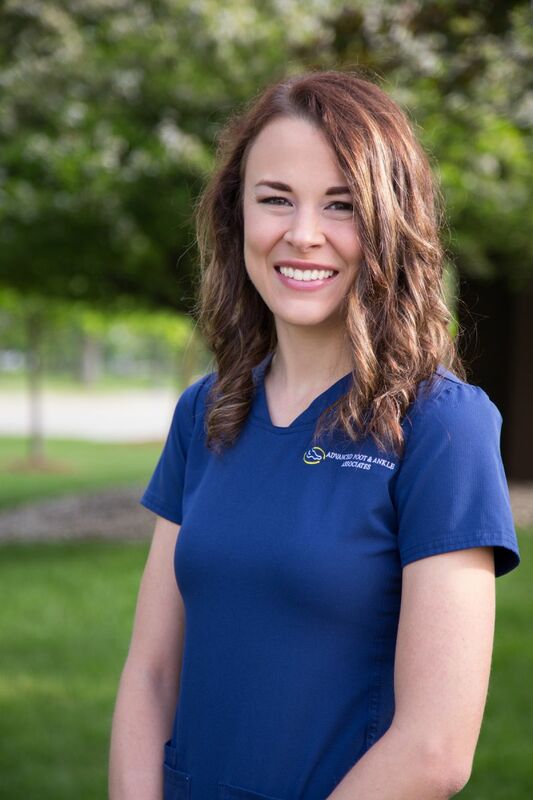 She spent the last five years working in family medicine at Mercy Health and is excited to get back to the small office environment at Advanced Foot & Ankle Associates. 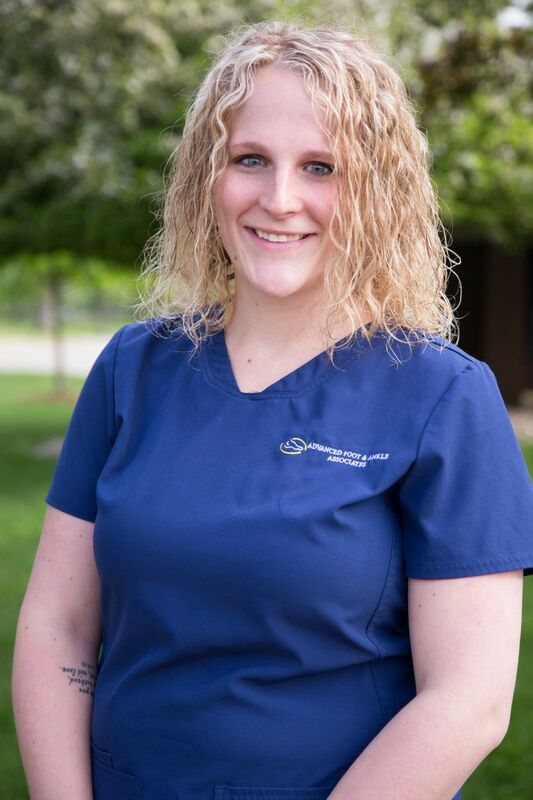 Mallory received an Associate’s Degree in Applied Science with a focus on Medical Assisting from Davenport University in 2011 and has been certified by the AAMA since January of 2012. She loves interacting with patients, getting to know their stories, and hearing about how we can help them with their foot pain or foot care. Being in a small practice, she is able to provide patients with the personalized attention they deserve. Why Podiatry? She is fascinated by the intricate structure of the foot. For example, the feet contain 52 bones which is 25% of all the bones in your body! She has been married to her loving husband since 2010 and has two crazy dogs that constantly keep them on their toes. In her free time she enjoys spoiling her nephews and niece. She also likes kayaking with her husband, campfires, playing volleyball and running. A fun fact about Mallory? On Valentine’s Day, her husband came home with 12 baby chicks. She now has several chickens and three turkeys that she enjoys caring for. The supply of farm fresh eggs is an added bonus! Marisa has experience being a CNA for 5 years and most recently a social worker in a local nursing home for the past two years. She graduated from Hope College in 2015 with a degree in Social Work. 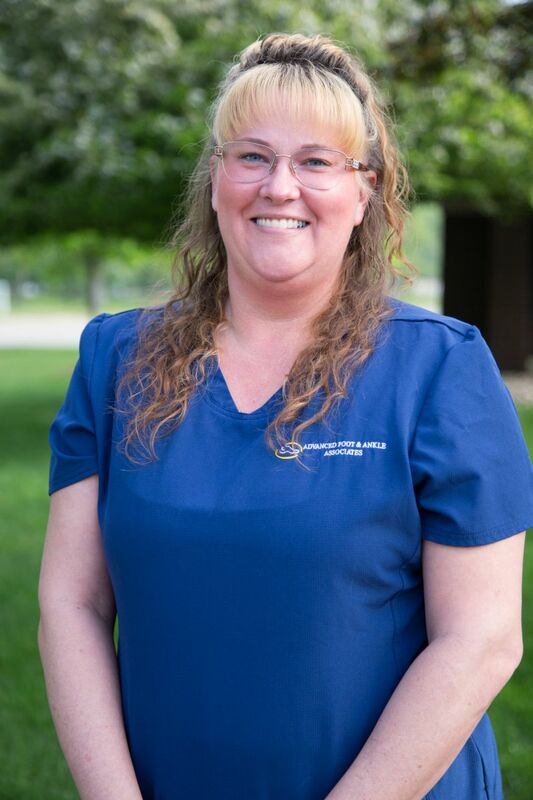 Even though she enjoys working with people of all ages, she loves that she gets to continue working with and helping the elderly population at Advanced Foot & Ankle. She feels very fortunate to be of a program that is dedicated to those who are at risk of falling. Podiatry interests her because it involves a part of the body that most people may take for granted. If you are having bad enough foot or ankle problems, it significantly can impact your everyday tasks and routines. When she is not working, she enjoys going on hikes with her dog and spending time with her family and friends. She grew up in Wisconsin and is a diehard Green Bay Packers fan. She even named her dog after one of the players. Lisa is a trained Medical Assistant with 9 years of experience, 5 of which have been with AFAA. Acting as the lead Medical Assistant, she trains and serves as a point of education for other Medical Assistants in the practice. Lisa is married with one daughter. She enjoys cooking, exercising, and boating and other water activities. She also likes to try Do-It-Yourself projects that she finds on Pinterest. She finds podiatry interesting because feet can affect a person’s entire body. Typically, if the feet hurt, the whole body can hurt. The treatment of the foot is very important and there are a number of different options for healing providing a variety in patient care. She enjoys making patients smile and helping them feel better. She likes working at AFAA because the office strives to make the patient and employee experience personal where people don’t feel like a number.